Dealers 1 - 8 | What Car? Friendly and accommodating and you feel youre important to them were typical examples of the feedback customers left on motorcodes.co.uk after visiting top-rated Jaguar dealership Marshall Jaguar of Ipswich. 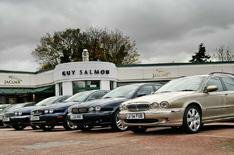 Proving that satisfaction is about more than just brand, Jaguar owners rated their dealers service a cut above in all but one area. They had the most friendly, helpful staff; the cleanest, most comfortable facilities; and the highest quality of workmanship, according to customers. How do they do it? Common sense, professional courtesy and attention to detail, said Marshalls Richard Trott. Theres a little more to it than that. Long-serving advisers who greet customers by name, highly trained technicians, free snacks, drinks and Wi-Fi, quiet office space or even a lift to the shops or golf course are all standard. Just one thing marred an otherwise straight-A report steep workshop charges, showing that even owners of premium marques have a limit to whats reasonable when it comes to spending on their cars. Yet again the Lexus network has stormed the JD Power index, just a whisker below the overall winner. Customers particularly rated the premises and facilities. They also found their dealers charges to be the fairest, with more than a quarter enjoying outstanding value for money. Lexus owners are also among the most loyal: 48% the biggest proportion in survey said they would definitely recommend their dealers service, while a further 39% said they probably would. Toyota dealers rank consistently in the top five for service satisfaction. Customers were impressed by the booking flexibility and by their service advisers. Work was thorough and completed on time, while cars were returned in good nick, a third of customers giving 10 out of 10 for this. A staggering 91% said they would be likely to recommend their dealers service. Feedback for Motor Codes Scottish Garage of the Year, Helensburgh Toyota wed never consider taking our car anywhere else was typical. Customers loved the plush facilities and the marque-matching premium treatment they received, rating M-B staff third overall for courteousness and professionalism. They werent entirely satisfied with the hefty bills, although the network did just sneak in above the industry average on this count. Dealers got most things right, with praise for service staff and workmanship areas, although customers didnt spend long there because their cars were usually ready on time. They also thought they were charged the right amount, a third awarding 10 out of 10 for fairness; 39% said they would definitely recommend the service. Skodas professional and friendly service advisers were popular with customers. Only the comfort of the waiting areas took the shine off it was Skodas worst rating. However, 40% of customers said they would definitely recommend the service, making Skoda the third most likely network to get new business this way. Land Rovers arent the most reliable cars, but LR dealers kept customers coming back by going all out to make sure they understood faults and what it would take to fix them. A quarter rated this service element outstanding, while 42% the second biggest in the survey said they would definitely recommend the service. Customers were ambivalent about their dealers service; workmanship was deemed above average, while the convenience of parking, comfort of the facilities and the bills were acceptable. Service advisers were ranked in the top eight for helpfulness, and a third of customers said theyd definitely recommend the service.